Getting your driver shaft to flex properly is one of the best ways to add major distance to your golf drives. Golf club shafts are meant to flex in the down swing. This flex stores a ton of energy (like an archer pulling the string back on his bow). When that flex releases at the right point (at impact) you will be able to launch the ball much further than you would if you were to rely on swing speed alone. The key to getting this flex to work for you is choosing the right kind of shaft. As you probably know golf shafts come in a variety of flex levels. They range from junior to double extra stiff like Bill is using in the video. Just as he says you need to find the right shaft for you. If you are young flexible and consider yourself to have a fast swing, a stiff shaft may be right for you. If you are a bit older and not quite as limber as you were in your younger days, you may want to get a medium flex shaft or senior flex so that you can properly load the shaft (and still out gun the younger guys). Loading on plane means that you are not getting all whacky with your golf swing when you are trying to flex the shaft. Staying on plane is crucial. The key is using your base (feet, knees, and hips) to stress the shaft. By having a strong weight shift on your down swing you are able to put enough torque on the shaft to load it without jerking down from the top or getting off plane. Once you have the shaft loaded you need to keep it loaded until impact. If you “cast” or release your wrists before impact you will lose all that stored power in the shaft (not to mention you won’t have proper wrist conditions at impact). To keep the shaft loaded you have to use your core pivot to drive the swing all the way THROUGH impact. 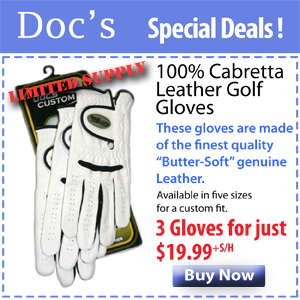 Your arms simply won’t be able to keep the shaft flexed on their own. Now go out and try this technique yourself. Oh and before I forget you should go check out Bill McKinney’s Natural Power Golf Swing you’ll be glad you did. You will learn how to load your shaft and many more insider tricks that will get you hitting longer straighter drives. We all know that confidence plays a large role in your golf game, and it’s on the putting green more than anywhere else that confidence can make or break your score. Here’s a quick example that I’m sure is familiar to you. You’ve made it onto the green in regulation and you are sitting with a simple 4 foot putt for birdie. If your confidence is high this putt is no problem. However you three putted the last hole. Making this 4 footer for birdie will erase that last bogie, but your confidence is low and you miss the putt. There is a high degree of skill involved in putting, but we all know that confidence is a key ingredient in eliminating three putts and sinking those 6 footers. That’s why you need a putting drill that not only sharpens your fine motor skills, but also your confidence. I use this drill all the time. It is the best putting drill I’ve come across over the years. The secret is that after sinking the 2 foot putt, the 3 foot putt, and the 4 foot putt you confidence is so high that you will often sink the 5 and 6 foot putts no problem. Like Darrell says in the video you should practice this from many angles. Using this drill on breaking putts will sharpen the way you read how greens break and teach you how the distance and speed of the ball affects the amount of correction you need. I can go on and on about how great this drill is but I’ll spare you. Just go out and try it (be careful it’s also quite addictive). If you want to start sinking more putts tomorrow click here. As you can see in the video this “work station” that you can easily set up on the driving range can help you fix several problems and get you hitting longer, straighter drives. The best part is you only need two spare clubs and a handful of golf balls. The first step is to lay a club between your stance pointing at the ball and perpendicular to your target. This lets you to easily glance down and see where the ball is in your stance (forward, back, or center). Next lay a club parallel to your target line and about 6 inches away from the ball. This makes it much easier to see your target line while you are looking down. Place a few golf balls along your target line downrange. Place the first ball 2 feet in front of the ball you are going to hit. Place the next ball 2 feet from that one, and so on. The final step is to place a few golf balls behind you, along your swing path. The first one should be about 3 feet behind you along your swing path. The next 2 a few more feet back along your swing path. The video shows pretty clearly what the swing path should look like. Your current swing path may not look like this (even if you think it does) so give this drill a shot. This workstation is designed to make it easy to visually check and make sure your golf swing is following the correct path. As Bill describes in the video the first ball that is placed behind the golf ball you are hitting teaches you to have a low take away. The phrase low and away is a great way to remind yourself of this. The back of your club should tap that ball out of the way as you take the golf club back to the top of your back swing. A low take way forces you to use your core and pivot to start your back swing (one of the keys to great golf). To practice this you can even let your club drag on the ground a bit in the take away. This drill helps you on your down swing too. 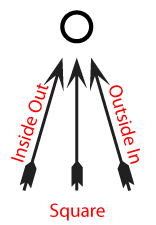 The balls placed along your swing path will help you see if you are coming over the top (swinging from outside to inside) or laying off (an exaggerated inside out swing). 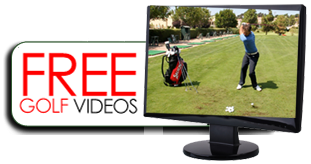 For another one of Bill McKinney’s free golf instruction videos click here. Be sure to come back next week for another great video tip.